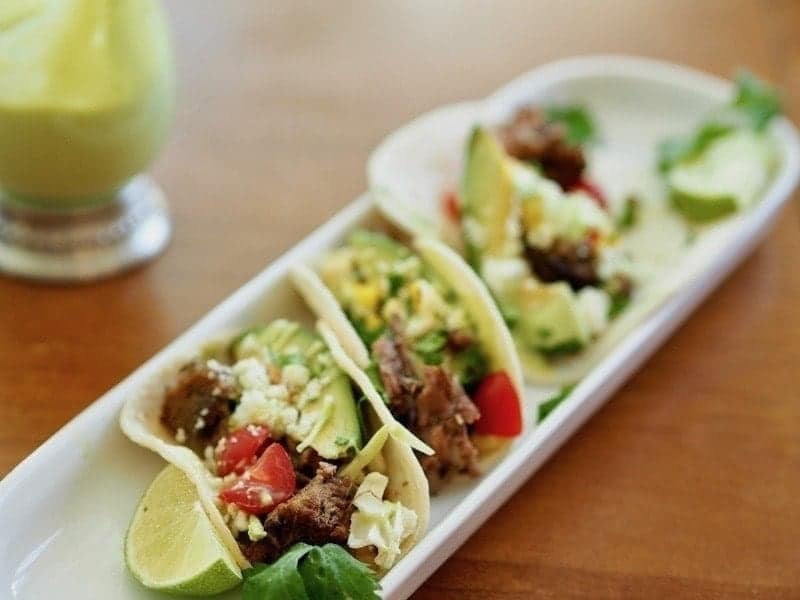 Juicy, tender and easy Barbacoa Street Tacos are made using a humble hunk of chuck roast, slow cooked with Mexican herbs and spices, lime juice and onion; resulting in a tangy, tender, loaded-with-flavor beef, the perfect complement for these healthy, delicious Barbacoa Street Tacos. An easy weeknight meal. It’s been a jam-packed, wonderful-good week! Starting off with my birthday (yay! ), dinner with dear wonderful friends, another birthday dinner with several of my close neighborhood girlfriends, kids tennis matches, swim team prelims for my boys, scrapbooking, time with a friend with Alzheimer’s and dinner with our sweet friends visiting from California. I needed a good go-to, recipe for a few dinners this week and this one definitely rose to the occasion. Not only were these easy, didn’t heat up my kitchen (95º yesterday-ugh!) but the beef was so very tender and packed with marvelous, savory Mexican flavors and spices. 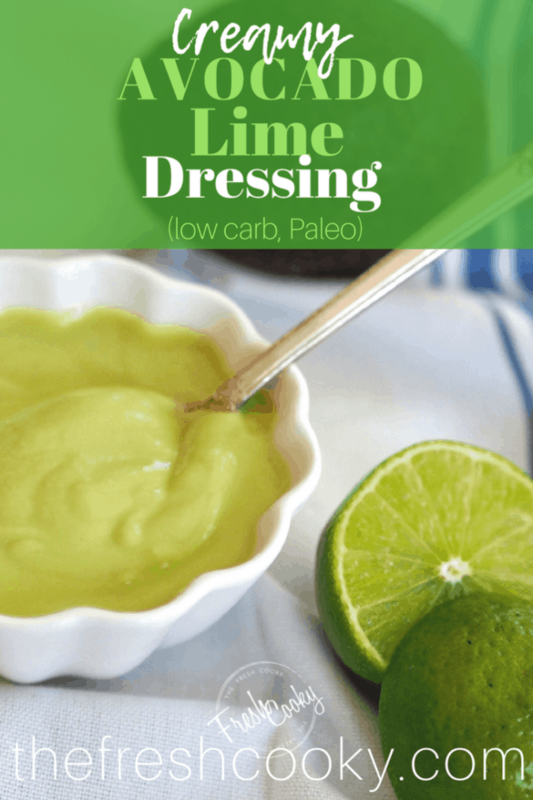 Paired with this amazingly simple, bright, fresh, and creamy Avocado Lime Dressing it’s a filling, yet light lunch or dinner! 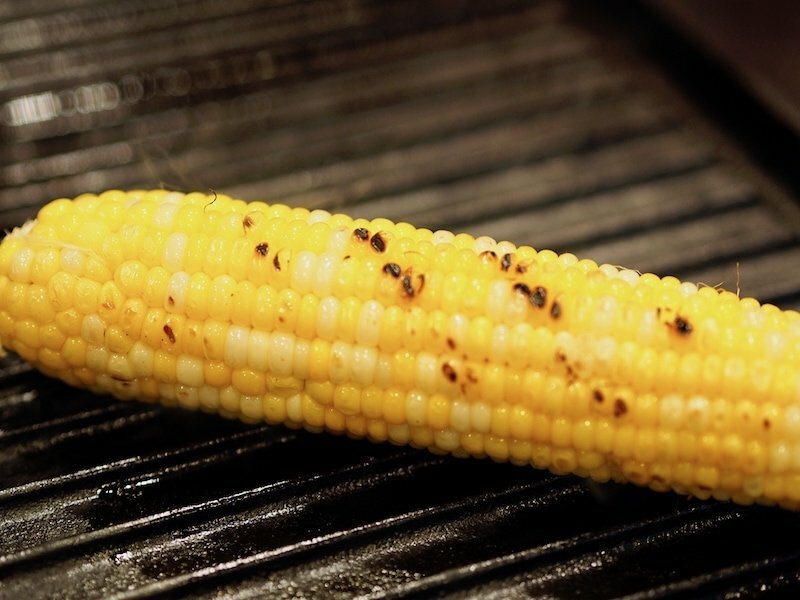 Even picky eaters will love this! Start your Barbacoa beef about 5 hours before you want to eat, though it will be fine if you need it to go longer. In a large pot*, pour in 2 tablespoons of olive oil or your favorite oil and heat over medium-high heat until hot. 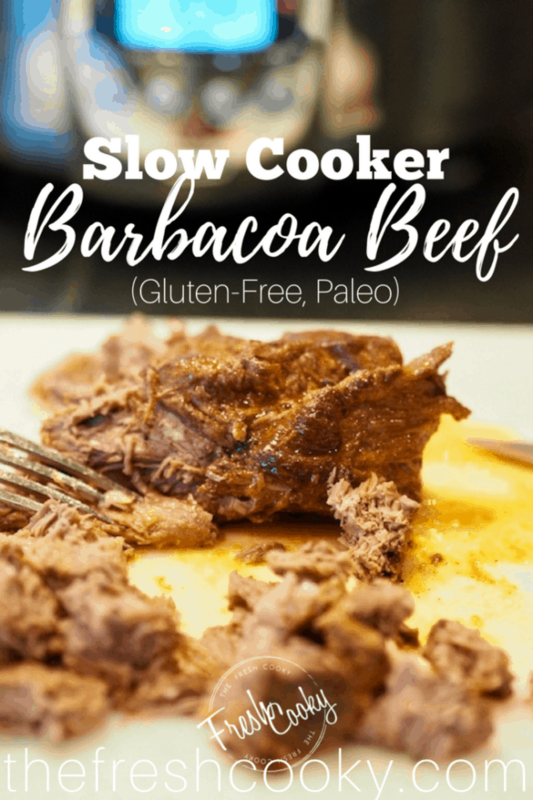 SLOW COOKER | If you have a slow cooker that can go from cooker to stove, you can do this step in your pan, which is what I did, I love my All-Clad Slow Cooker! 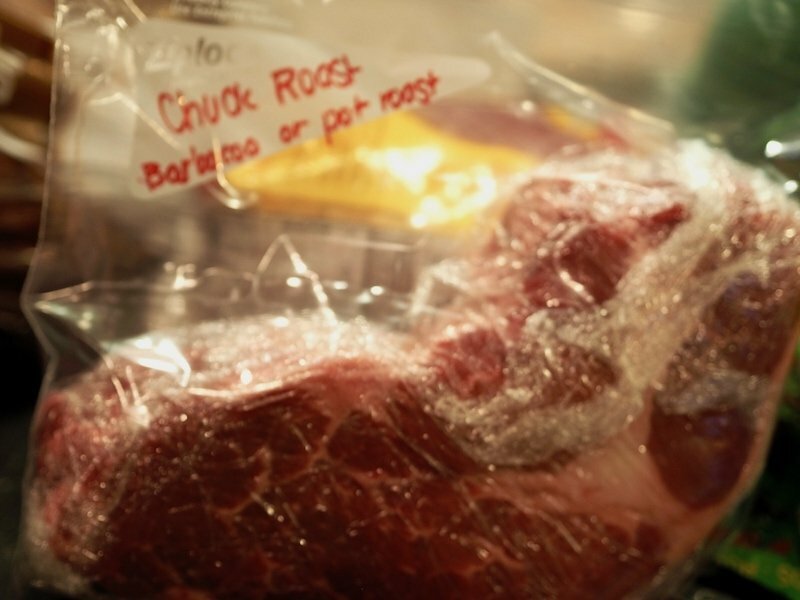 Additionally, I buy my chuck roast in bulk, wrap what I don’t need in plastic wrap, place in a freezer ziplock, squeezing out any extra air and be sure to mark it so you don’t end up with a mystery meat. I’ve also started marking what I could make with whatever I’m freezing, kind of takes some of the guess work out of a frozen piece of meat! 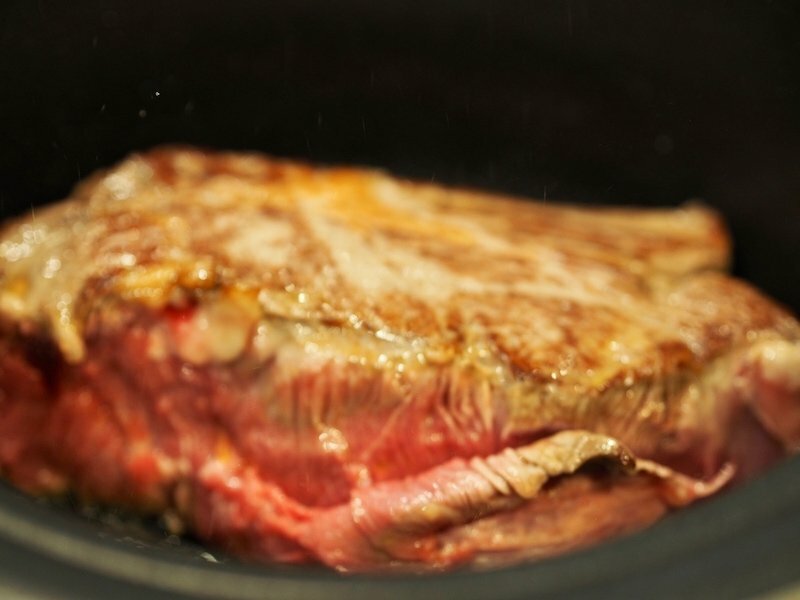 Place your chuck roast (or some people call them chuck steaks) into the pot and sear on each side until crisp brown, sprinkling with a little kosher salt. It should just be a few minutes per side, make sure you keep your pot hot, you don’t want to cook the meat, just sear or brown it. 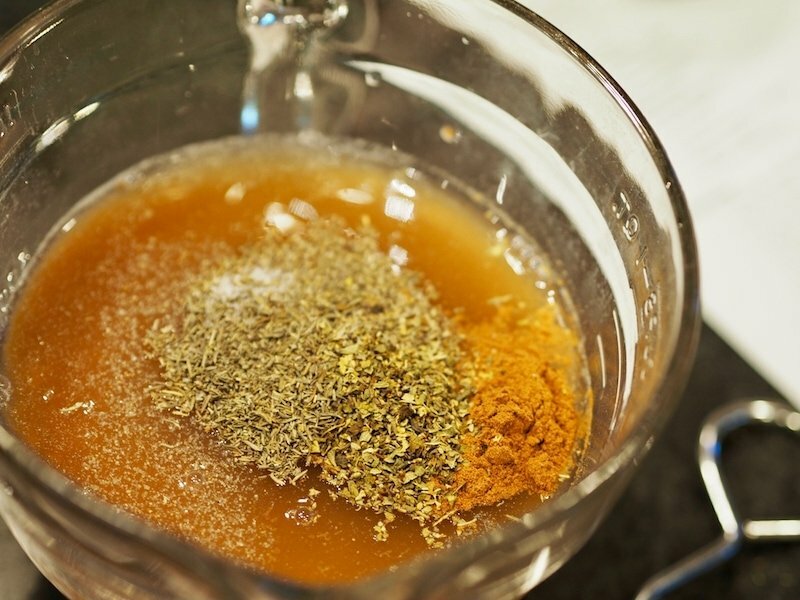 While your meat is searing, in a small mixing bowl, place the following ingredients; beef broth, apple cider vinegar, tomato sauce, lime juice, garlic powder, thyme, oregano, cumin, cinnamon and salt and pepper. Stir or whisk until combined. 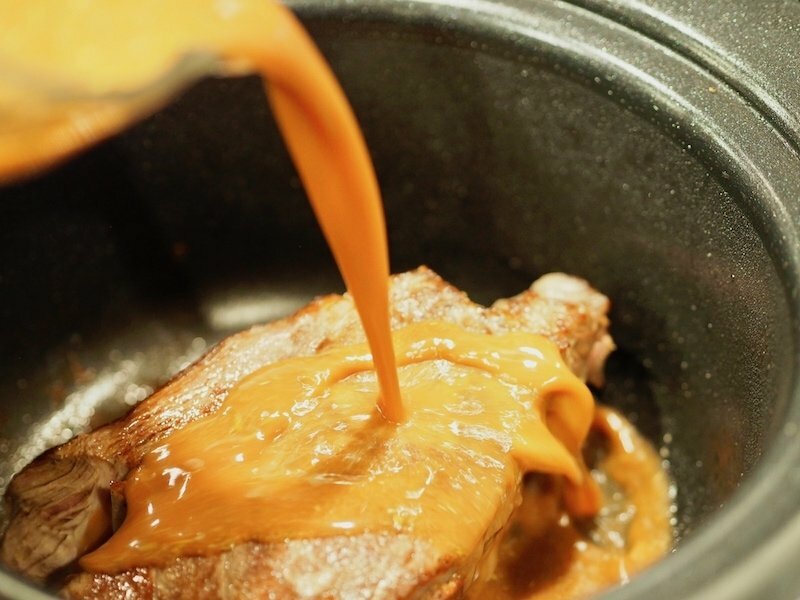 Once your beef is seared, return to the crock pot (slow-cooker) and then pour your mixture over the roast. Chop your onion and sprinkle over the top of the chuck roast. Cover and cook on low for 5 hours (I needed to rush mine just a bit, so I cooked on high for the first hour, then returned to low for the balance of time). Resist the urge to check on it as slow cookers do best when you don’t open the lid. Slice, “pull” or cube the chuck roast into bite size pieces. 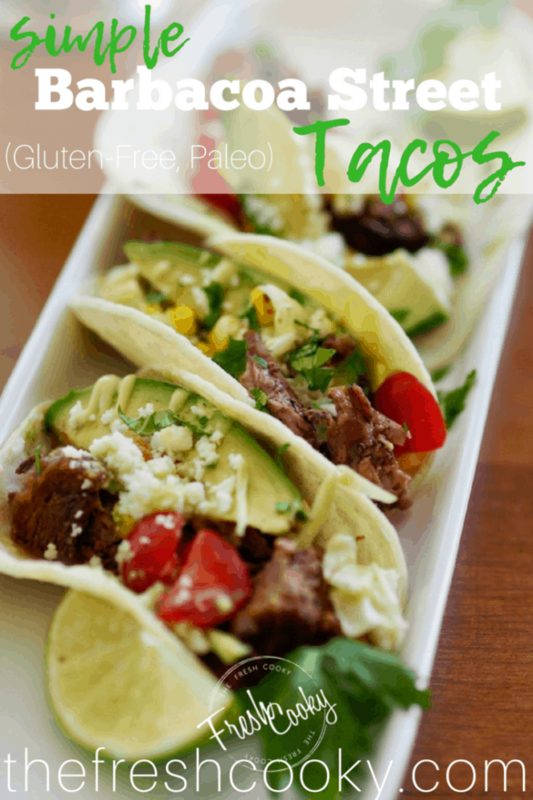 At this point the beef may be eaten just like a pot roast, spoon on some of the juices from the crock pot, serve with Cilantro Lime Rice and a crisp salad or….read on and make it into these fresh and amazing street tacos. If making street tacos, assemble your toppings in small bowls, for easy taco making. I love these small bowls, great for toppings, dips, sauces, salsa’s and more! I provided the option of Mini-Taco (or street taco) sized corn or flour tortillas, that I found at my local grocery store or you may certainly use regular sized corn tortillas or soft flour if you’d like. If trying to go grain free all together, try making it into a wrap by piling your taco fixings on a sturdy leaf of Butter or Romaine lettuce. 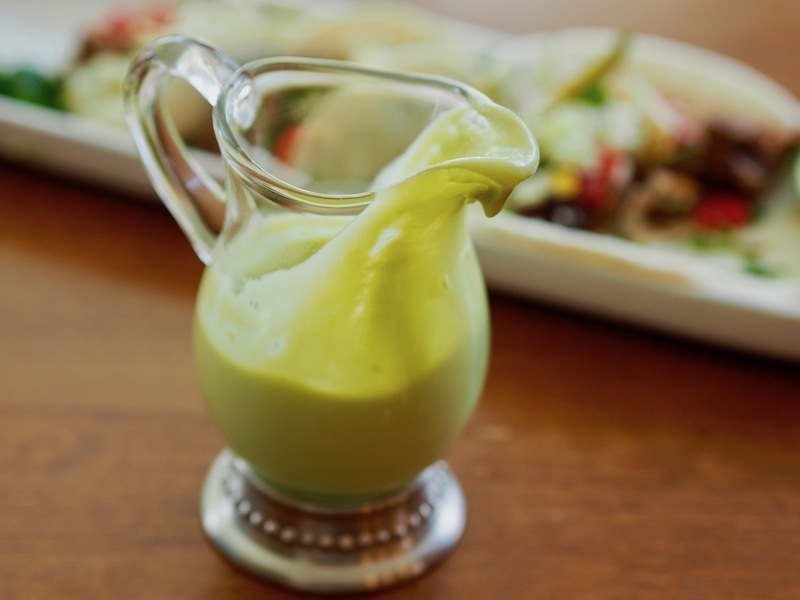 If making the Avocado Lime Dressing which is delicious on salads as well as tacos, simply place your peeled, seeded and sliced avocado into a blender* along with juice of 1 lime to start and 1 tablespoon plain yogurt, season with a little salt and pepper to taste. *I used my Ninja blender (one of my favorite kitchen tools!) worked fabulous! NOTE | Watch the size of your avocado and limes, you may need to adjust your lime juice up or down depending on the size of the avocado or else it will be really limey — which I like, but others may not. Blend and add a little lime juice at a time, taste, adding water to thin as needed. Store covered and refrigerated until ready to use. If you enjoyed this recipe, I’d love for you to comment below and give the recipe a 5-star rating; and repost your picture on Instagram don’t forget to add the hashtag #thefreshcooky. This recipe was moderately adapted from Jar of Lemons. I’m sharing this recipe on a few of my favorite link parties. Please click on the links below to see other amazing, easy and delicious recipes! 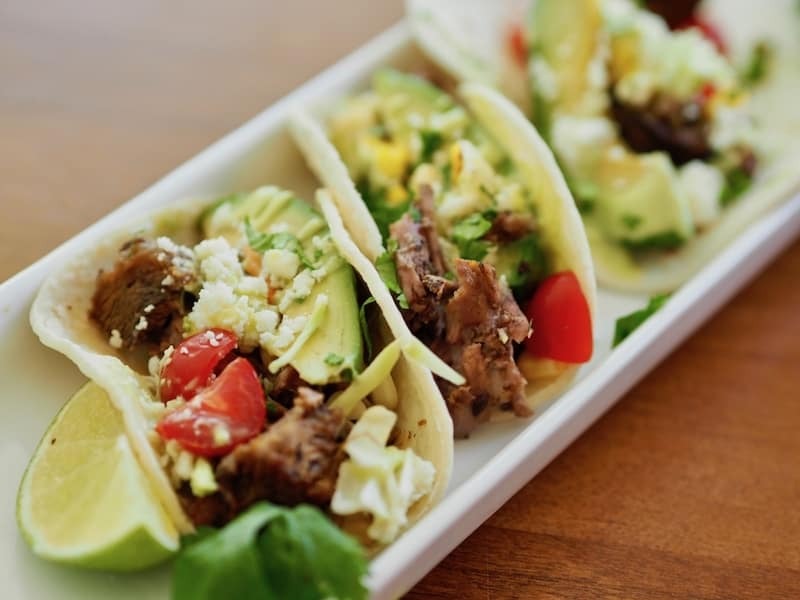 Simple and tasty, slow cooker Barbacoa Beef Street Tacos. Slow cooked in a savory, spicy (but not hot) sauce, with loads of fresh taco toppings. An easy weeknight meal or lunch. In a large pot (or stovetop safe slow cooker pot) drizzle in 1-2 tablespoons oil. Place chuck roast (or steak) carefully in the pot and sear (brown) on all sides, just a few minutes per side. Sprinkle with a little kosher salt. In a medium mixing bowl; mix together your beef broth, tomato sauce, vinegar, lime juice, spices together. 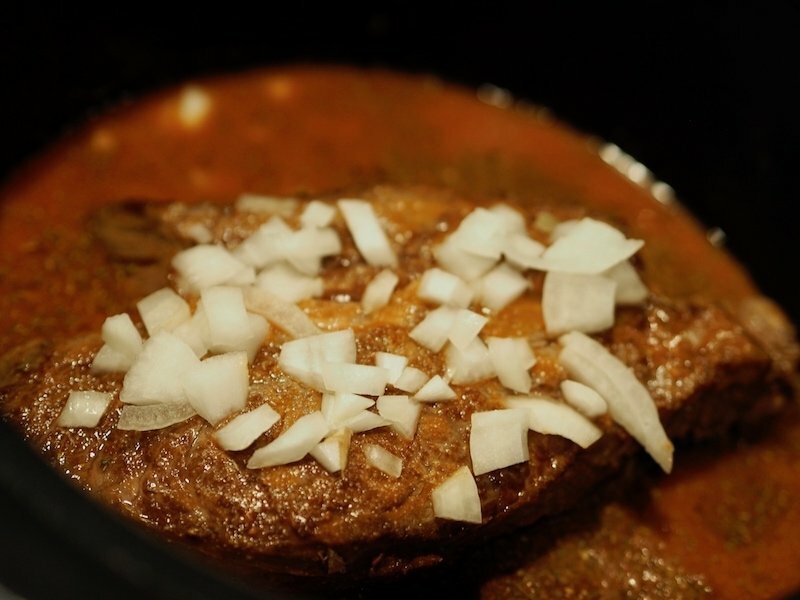 Once your beef is seared on all sides, transfer (if necessary) to the slow cooker or crock pot and pour over your broth mixture. Top the beef with your chopped onion and cover. Cook on low for 5 hours (if you need it ready a bit sooner, cook first hour on high, then reduce to low for balance of time). May also cook all day if needed. 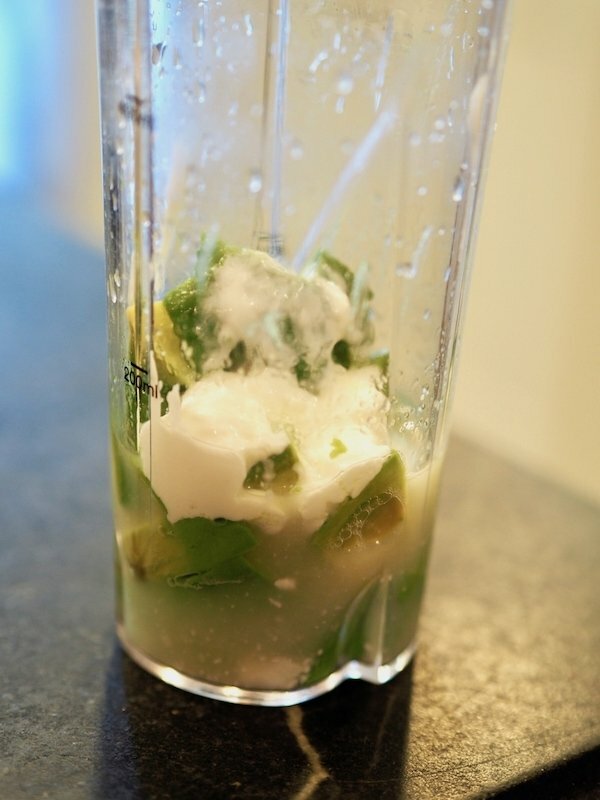 In a blender place your peeled & seeded avocado, lime juice and yogurt. Whir until smooth. If necessary add water until a pourable consistency. Note: If you use a smaller avocado and larger limes it will be really “limey” which I don’t mind, but you may want to taste it after the juice of 1 lime, then add more as desired. Season with a little salt and pepper, to taste. Store in fridge, covered until ready to use. 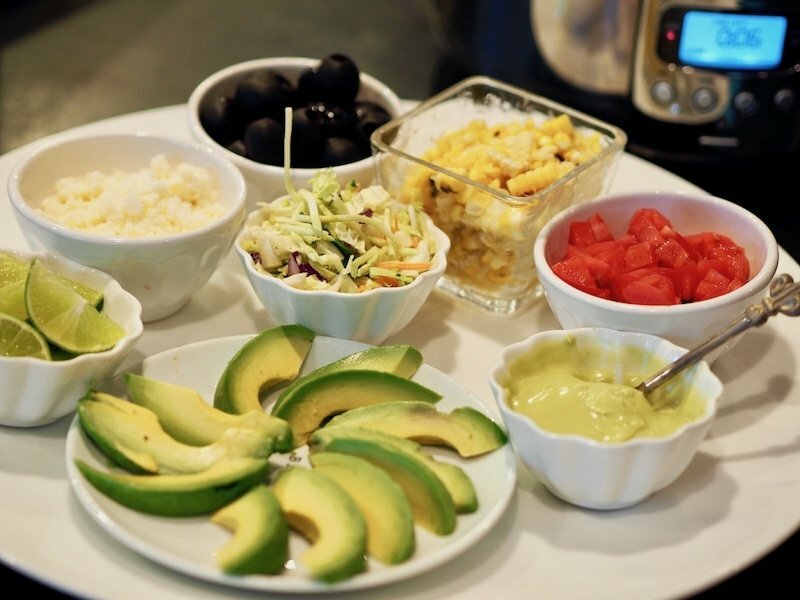 Prep your toppings in small bowls so each person may assemble their own custom tacos. 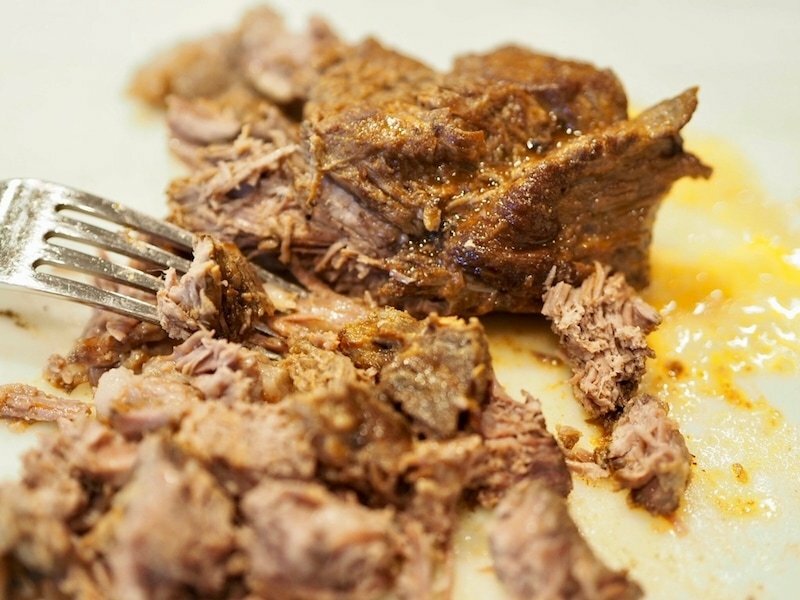 Remove your meat from slow cooker, and using a sharp knife, slice or chop into bite size pieces. Serve with a wedge of lime and fresh, chopped cilantro along with a drizzle of the Avocado Lime Dressing. TIP | Need to have this recipe ready sooner than 5 hours, for the first hour, cook on HIGH then lower to low for the next 3 hours. Additionally, this may be cooked on low for 6-8 hours. 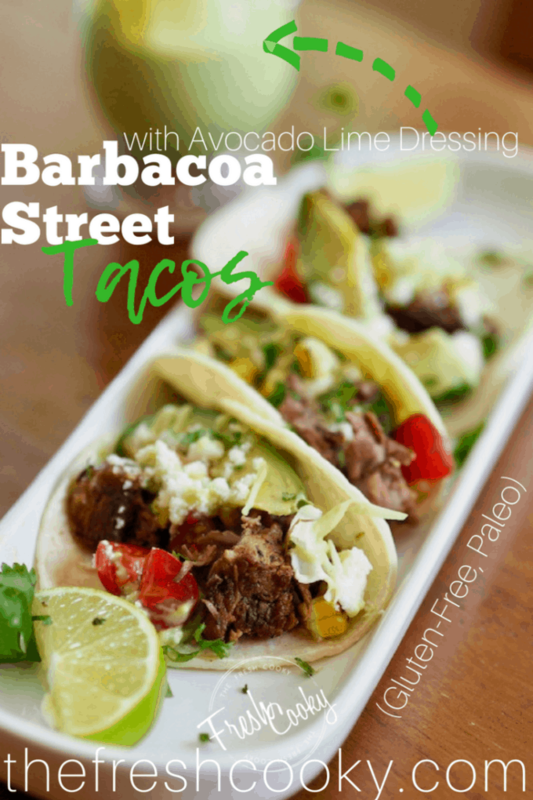 © 2018 | This recipe for Easy Barbacoa Street Tacos was featured first on The Fresh Cooky. Thank you Allie!! Always so fun to have you over! Wow! Made this today in the slow cooker; ate it all up tonight! My son said, “The food gods are smiling on us!” Really easy — and the avocado / line / yogurt sauce is sublime! Terrific combo. We’ll Make this again for sure! YIPEE! Thank you Cameron, so glad to hear!! I could make this recipe once a week — it was so good. Loved the dressing! Thanks Kristin! I do appreciate you! !